Super Hero Boy: What is that I see? Finding things that will entertain Connor in the car these days is getting harder and harder. He just wants to be up running around and needless to say we are off to FL for a week here shortly and I'm starting to dread the car trip down. What has changed recently is Connor's ability to recognize items and his vocabulary so when the new Peek a Boo Bag from International Playthings arrived I knew we had a winner. The Peek-a-Boo Bag is a pretty simple idea, a cloth bag with a clear panel filled with plastic beads and colorful little shapes. Call it a portable Ispy game (ironic seeing as we are running an Ispy game of our own for the party! heh) as the bag comes with a little detachable tag on the back that lists all the shapes inside the bag. One person can hold the list of shapes and ask the child holding the bag to find them. Connor has yet to learn all the shapes yet but he has the best time finding each shape and then asking me "What's this?" but it totally cracks me up when he sort of knows what something is and gives me a general answer. All balls are balls to him regardless if its a football, baseball, basketball ect. I'm still not sure how he identifies a football as a ball on this tiny scale as well its not round but he picked that one out first! He also identifies all bugs as bugs regardless if its a spider or whatever... again he labeled the spider as a bug and to be honest with you I'm not even sure he has ever seen a spider. Then he proceeded to tell me that we "squish" bugs.. heh. Perfect for a road trip, a way to entertain a little one at a doctors office, or even just for quiet play when you've totally had it with playing marching band in the living room. Ohh for a few minutes of quiet every day. Wouldn't that be fabulous? 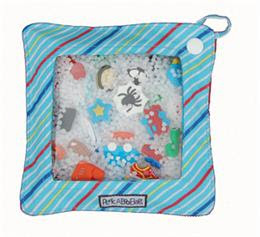 The Peek-a-Boo Bag is available at the International Playthings website. We have one Peek-a-Boo Bag to give away to one lucky winner! Leave a comment on this post. Check out the Peek-a-Boo Bag and tell something you spy in the picture of the Peek-a-Boo Pack! Make sure you read below to earn extra entries including a scavenger hunt entry. Answer the I Spy trivia question "Check out International Playthings website and take a look their toys! I spy something that is fun to ride on and makes for a good walker for baby too!! Do not leave this entry in your comment all trivia question answers go to contestsatsevendogs@gmail.com. Use the subject "International Playthings" Posting "I spy" answers in comments will disqualify you! THREE extra credit per person. Please post your extra credit in a separate post. This contest will end May 30th at midnight! I spy a star in the rough and tuff bag. Thanks for the chance. I see a spider in the Rough N Tuff bag! I see a beach ball in the "Sugar "N" Spice" Peek-A-Boo Bag. I think I see a frog in the A to Z Peek a boo bag. I spy a blue whale. I answered the I Spy question. I spy a whale, ladybug, and kite on the peek a boo pack! I spy a spider in the bag. Thank you! I spy a spider. Thanks for the great giveaway! I see blue sunglasses in the Sugar & Spice bag. I spy a ladybug. Thanks. I see a very blury whale being juggled by a zebra!